For the English in the New World there are really three labor options. One is to transport people from England to the New World. Another is to employ or exploit the indigenous labor... And the third is to bring people from Africa. At the end of the 16th century, Spain and Portugal dominated the South American continent and parts of the Caribbean. They had also gotten a foothold in Central America and the southern portions of North America, in Florida and the Southwest. England, with colonizing ambitions of its own, was eager to establish a foothold on the North American coast. Urging their countrymen to join in the race for the colonization of the New World were two men, an uncle and his nephew, each named Richard Hakluyt. In a number of popular pamphlets they made the argument for colonization: England stood to gain glory, profit, and adventure. The younger sons of English nobility, lacking property at home, would have new lands to lord over. Merchants would have exotic products to bring home and new markets in which to sell their goods. The clergy could convert "savages" to Christianity. The landless poor, who burdened English towns and cities in increasing numbers, would have opportunity to rise up from their poverty. 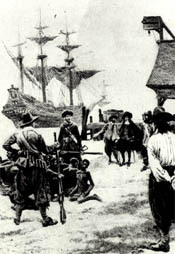 Captain John Smith, one of the leaders of the Jamestown venture, later wrote that the force behind the settlement "was nothing but present profit." English colonial ambition and the exhortations of the Hakluyts set the stage for England's first lasting settlement in the New World: Jamestown. The colony on Chesapeake Bay was first and foremost a business enterprise. It was funded by investors in the Virginia Company of London, who recruited the men who would settle Jamestown. The investors wanted what all investors dream of: a quick return of profit. The settlers were told to settle on an inland river that might lead to the Pacific and the riches of Asia. Failing that, investors hoped settlers would send home profitable goods, such as minerals, wooden masts, dyes, plant medicines, glass, and tar. Not willing to give up and absorb heavy financial losses, the Virginia Company of London sent more colonists from England. In the next few years, they experimented with various types of tobacco, and by 1617, found success with a variety of seed from Trinidad. Only three years later, a staggering 55,000 pounds of tobacco reached English markets. Jamestown had found a way to survive: by growing and selling tobacco. But all these new tobacco fields required many hands and hard labor. At first, the men needed in the fields came from the working classes of England. While the world of colonial America was controlled by the wealthy Englishmen, most immigrants were poor men under 25 years of age. At first, the supply of willing conscripts matched the demand. The population of England had swelled from under three million in 1500 to more than five million by the mid-1600s. The homeless and the unemployed turned their hopes to the New World. Throughout the 17th century, between half and two-thirds of all white immigrants to the American colonies came as indentured servants. In exchange for passage to Virginia or other colonies, these poor English people traded 4-7 years of their labor. They were fed, sheltered and clothed in exchange for their work. After their time was up, these indentured servants received their so-called "freedom dues." This often amounted to a bushel of corn for planting, a new suit of clothes and 100 acres of land. Now these men (and small numbers of women too) were free to labor for a living on their own. The turn-over in indentured servants was rapid, so aspiring planters considered two other options for solving the need for plantation labor. One was to hire or exploit the native Americans. But such workers were susceptible to new diseases and often proved unreliable, as they could always choose to leave work behind and return to their people. There was also a second option. In 1619, a Dutch ship that had pirated the cargo of a Spanish vessel -- captive Africans --anchored at Jamestown in the mouth of the James River. The ship needed supplies, so the Dutch sailors traded the Africans for food. The colonists purchased the Africans, baptized them, and gave them Christian names. At least some of these Africans, like their white counterparts, were purchased according to the usual terms for all indentured servants. They and other Africans who were transported to America at this time would become free after their years of service. The English who had settled in Jamestown and, over the rest of the 17th century, in the other British North American colonies soon reached a turning point. Would they continue to hire Europeans and Africans as indentured servants? Or would they rely on Africans as enslaved workers for life, the model that had developed in the Caribbean? The colonists had a choice to make. They could use laborers who were free or who would one day become free. Or they could force people to work their fields for them indefinitely, without any hope of freedom for themselves or their children. To this day, we carry the scars of the decision they made: gradually, over several generations, they chose slavery.